My buddy and I had an impromptu detecting trip today. I was at the dentist for 2 hours and we decided even though it was late in the day we would hit some of our local spots. About 3 hours in we were demoralized and complaining a lot. It got so bad were flipping dirt in heavy iron while the other guy pinpointed or scanned the clods. We both decided the day was over when he suggested we give it one last shot up a hill. He went up ahead of me and yelled to come up a few minutes later. He had a seated half! Wait no! A Capped Bust Half! Big silver in the middle of nowhere is always cool! He was reveling in his find and told me to take a swing. I said no and that he should check his spot for more coins. He did and then went back to enjoying his sweet find. I started orbiting the area and was finding modern !!!! here and there. I worked my way back to his spot and about 3ft... ....away got a solid 95-98 on the Deus. I told him we have more coins but I was worried it might be rolled iron giving off a false signal. Nope! 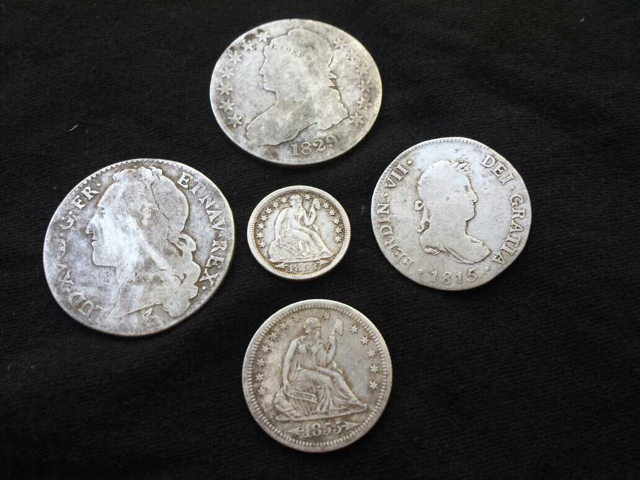 It was a 4 reale, 2 reale, seated quarter, and seated dime! Sorry for the pics but for now these will have to do. Last little bit I think there are gold nuggets in the hole or at least flake. This is the second cache we have found together. Pretty awesome experience! Whites MX Sport Rules!!!! Per my buddy! Great story ! Fun play by play. Excellent in-situ reveals ! Good to see some California action. After all, who needs those sissy East Coast LC's anyways, eh ? What I really want from that hole is a coin purse clasp and a gold coin... and gold nuggets.... It was getting dark, so we had to leave before really cleaning out the spot. 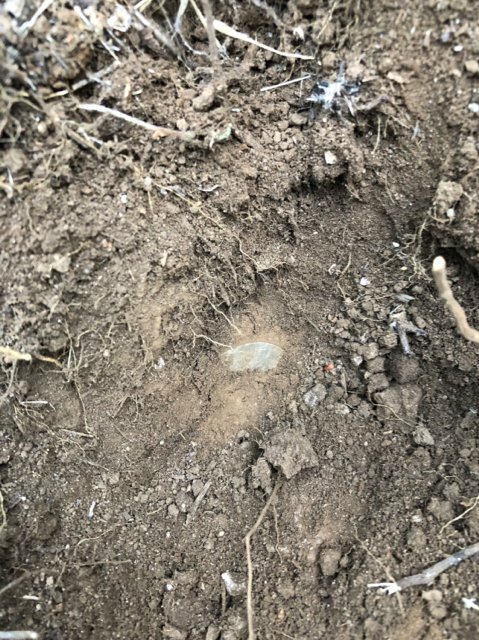 Because there was so much rock in the area and not so much soil another coin could easily be hidden from out detectors. We haven’t been back yet. Probably going to get back out there in a few days. Outstanding! Hey, you ever think they buried the big nuggets a foot or so below the surface stash? A guy once told me they did that with their contraband in prison. The guards would notice freshly dug dirt, so they would dig up and confiscate the teacup stash, but not keep digging down, where the big stash was. You might be digging decoys! Fantastic stuff, and in Cali too! Put my buddies Cap on, took 2 seats, and then sh*t got Reales!!! Awesome finds! As if the gold coins aren't enough you gotta go "bust" out that kinda silver? nice work to both of you, now get back out there! You have vacation time at work? If so, I suggest you use the rest of it congrats!!! Just goes to show you NEVER know what is going to get under your coil. Thats a awesome stash right there. Youve done well with the forgotten stashes. Not sure why this isnt a featured thread? Maybe you are being blacklisted cuz you wrote sh*t in the title. Haha. And update this thread with some better pics. Pictures updated. I wasn’t sure if that would fly on here but maybe I was just cleaver enough?